Harmen Vos, candidate for Mayor of Clinton Township, cheated his constituents when he failed to disclose conflicts of interest before voting on Clinton Township legislation. 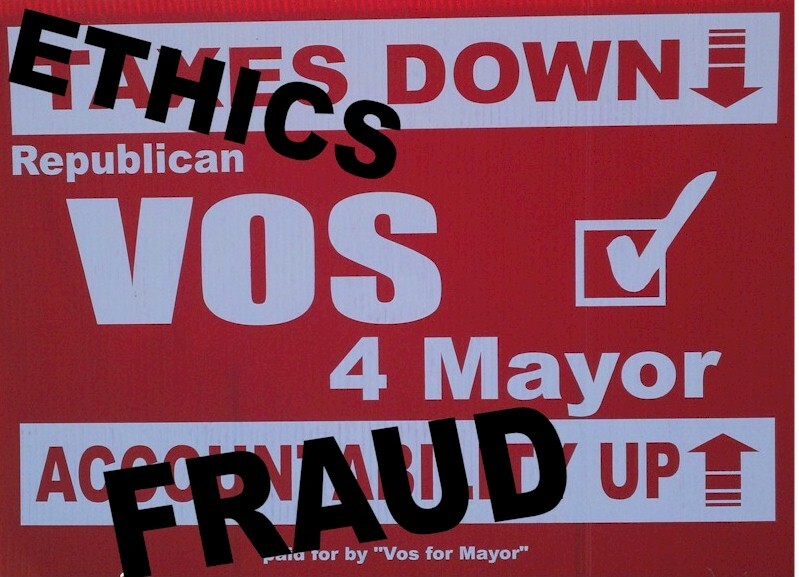 Vos cheated voters and violated NJ election law when he hid the business connections of his campaign contributors. 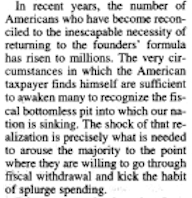 And now this self-proclaimed “Christian Patriot” is cheating the founding fathers: Harmen Vos has shamelessly stolen the ideas and words of real patriots — without crediting the authors of the brave words in his most recent letter to the editor. Harmen Vos promises ACCOUNTABILITY UP! on his signs, and pretends he’s fighting for liberty and freedom. In reality, his campaign has been about ETHICS DOWN! and FRAUD UP! It’s customary for candidates to put their best foot forward in this “last letter,” and to express who they are and what they plan to do if elected. Every single word, every sentence, and every paragraph in Harmen Vos’s letter is stolen, verbatim, from documents written by the second President of the United States, John Adams; by William Tyler Page, descendant of the tenth President, John Tyler; and by a Tea Party blogger in Arizona, Blaine A. Dunning. The first two paragraphs are from William Tyler Page‘s American Creed, written in 1917. I believe in the United States of America as a government of the people, by the people, for the people; whose just powers are derived from the consent of the governed, a democracy in a republic, a sovereign Nation of many sovereign States; a perfect union, one and inseparable; established upon those principles of freedom, equality, justice, and humanity for which American patriots sacrificed their lives and fortunes. I therefore believe it is my duty to my country to love it, to support its Constitution, to obey its laws, to respect its flag, and to defend it against all enemies. Vos claims in his biography that he worked for a long time as a professional journalist: “As a freelance journalist for a major Holland newspaper…” (Letter to the editor, Hunterdon Review, December 2, 2010). He thus knows what plagiarism is, and why it is unethical and sometimes illegal, and why it is also called “a moral offence.” Vos should have cited the authors whose work he used, giving them credit. 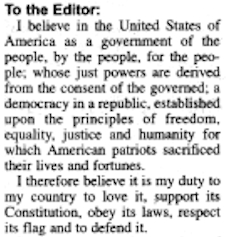 But that would not have served the purpose of his letter to the editor, which is to express his own ideas and who he is, and to impress voters. So he fraudulently signed the letter as his own. How could a highly-visible mayoral candidate so shamelessly pretend that stolen ideas are his own? It’s easy, when Vos has been misrepresenting himself all along. A college education is certainly not required to run for mayor or to serve in office, but honesty and transparency are. Vos promises us ACCOUNTABILITY UP!, then shamelessly credits himself with a college education. Vos also claims to have served as a Dutch Green Beret. Was he? Who knows? Is Vos even a U.S. citizen? It’s difficult to believe anything he claims. A look at his many letters to the editor reveals dramatically different writing styles, and extreme vocabulary variations. It’s impossible to believe he wrote all of them. Who will be our mayor if Harmen Vos gets elected? John Adams? William Tyler Page? The people who wrote Vos’s other letters? The hidden real estate developer that Vos failed to identify in his NJ ELEC campaign disclosure filing? 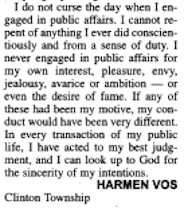 Look at these clippings from Harmen Vos’s campaign literature. He steals the work of others and tries to pass it off as his own. (Can he be trusted?). 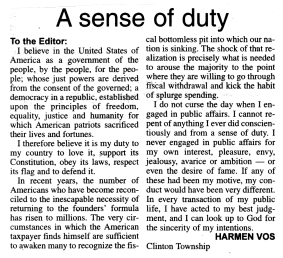 But Harmen Vos’s conduct is far from exemplary, and he clearly does not understand or respect the American way of life. Do we need a dishonest politician who can’t express his own ideas or plans for Clinton Township?